A magnificent piece of engineering that the photos really do not do justice to. This is a mechanical game enclosed in a perspex cover, hence the hazy photos. 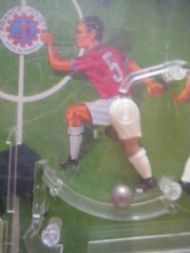 Use the red levers at each end to make your players kick the ball bearing towards goal. Score a goal and a bell rings. Wonderful item from Jouet in France. Superb tinplate base with plastic cover. 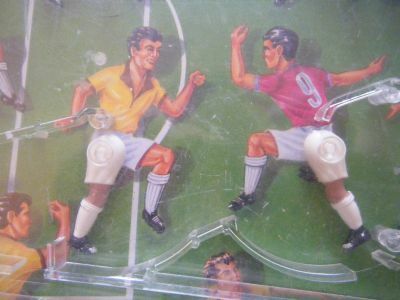 The players legs kick and the keepers arms wave around. The ball bearing drops into curved ledges beneath each player so that the leg can swing and kick the ball. Great graphics for the players but the actual kicking movement is tricky to master. They tend to kick the ball back over their heads!! 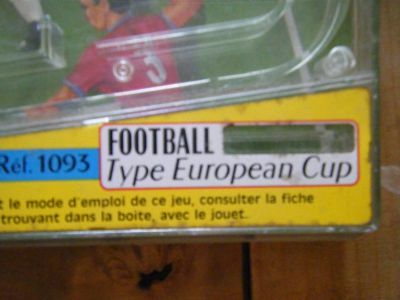 The game is Type European Cup by Jouet - prolific French toy makers. 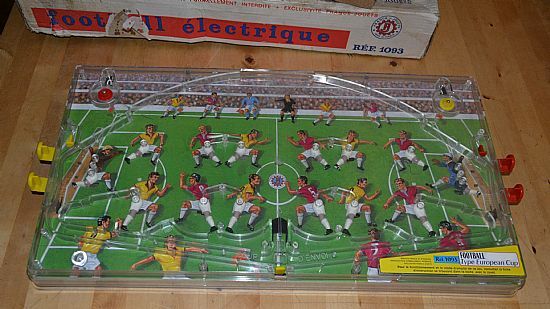 The box and game both have the word 'electronique' covered up - could there have been a super duper posh version too?